This 2/3”, 2.2M 3-MOS P2 HD shoulder-mount camcorder is the first with native AVC-ULTRA recording and built-in microP2 card slots. The PX5000 features 720p* and 1080p/i recording, and is also the first P2 HD camera that will record in full-resolution, 10-bit 1080/60p (in AVC-Intra100). Panasonic’s AVC-ULTRA offers master-quality and/or low-bit-rate 10-bit, 4:2:2 recording in Full HD to meet a variety of user needs from mastering to transmission. Addressing the need for high-speed file exchange, its high-resolution AVC-Proxy encodes in parallel with higher bandwidth production formats, enabling fast, efficient offline editing, at bit-rates from 3.5 megabits down to 800 kilobits per second. The PX5000G incorporates a selection of AVC-LongG quality levels, including AVC-LongG50 and AVC-LongG25. Designed for applications where file size is critical, these 10-bit, 4:2:2 sampled codecs record in a much smaller file size, saving storage cost and transfer times over MPEG-2 while maintaining equal or better video quality. In the future, lower bitrate AVC-LongG12 will be made available. 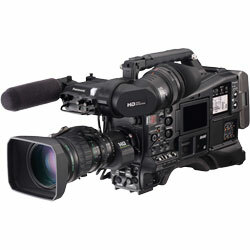 The PX5000G offers optional AVC-Intra200* recording, which at twice the bit rate per frame of AVC-Intra100 is visually lossless, delivering a master quality codec in an affordable, file-based camera. The AVC-Intra200 option will yield a cost-effective approach to network-level program acquisition, film-outs and higher levels of color correction In addition to AVC-LongG and AVC-Intra100/50, the PX5000 offers standard recording in DVCPRO HD, DVCPRO50, DVCPRO and DV. The camera has two microP2 slots and two standard P2 card slots,** as well as an SD card slot for proxy/metadata recording. MicroP2 cards offer a faster transfer speed, smaller size (SD card size) and are lower cost compared to a P2 card. Professional interfaces include MON out (can be set to output HD-SDI), HDMI out, HD/SD-SDI in/out, 3G-SDI out, genlock in for multi-camera operation, timecode in/out, USB 3.0 (host) and a two-channel UniSlot compatible wireless receiver. HD/SD Multi Format/Multi Codec -- In addition to 1080/60i, the AJ-PX5000G supports 24p, 30p,60p, and 720p multi HD format and SD recording. Also, 50i, 50p, and 25p are supported by 59.94 Hz/50 Hz switching. Dynamic Range Stretch (DRS) optimizes scene image contrast at the pixel level, reducing overexposure and crushed shadow content and dramatically improves human skin rendition. Highly accurate flash band detection and compensation algorithm that minimizes partial image exposure due to strobe lighting. 7-mode (HD/SD/FILMLIKE 1/FILMLIKE 2/FILMLIKE 3/FILM-REC/VIDEO-REC) gamma selection and extensive digital image settings. 50 Hz and 59.94 Hz switchable for worldwide use. A 10-pin remote terminal enabling remote camera operation; and an optional camera studio system. Two optical filters, ND and CC, with four positions each. The CC filters are 3200K, 4300K, 5600K and 6300K;.NDs are Clear, 2, 4, and 6 stops. Uplink device support. The status, settings, and bandwidth condition for the LiveU LU40 Series can be displayed on the camera viewfinder, and uplink start/stop can be operated. This allows the camera operator to handle live relays comfortably and securely.